I hope you manage to find him/her. I'm sure I will find it soon. 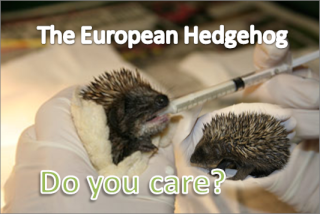 Any Hedgehogs with injured legs (and there have been a few!) normally come back to the feeding station to gain weight. That is, if they make it another night I'm keeping a very, very close eye out- I'll have everyone in the family and in the village on the look out! I've only just had one with leg problems, went to the Vets, they had a look. Said it had something stuck around its leg. On closer inspection it was the top of a can- you know the bit you open it with? That was very hardwork indeed to get off. Poor thing. Luckly there was no further problems. I say 'luckly'- it should have never happened in the first place! It makes me so cross that people have no thought when the throw their rubbish to the ground. There is no need for it, just shows them to be thoughtless and selfish. It was the same with that Mcdonalds thing 'McFlurry' I think. I'm never, ever eating from there again. I think they have changed the design, but it should have never happened in the first place! Honest to God, why? It is just horrible the amount that die through people who could not careless. The Hedgehog was found- well not by me. I told the whole street to be on the look out. Someone down the road found it. They then went to the Vets, gave it a check up and found it's broke its leg. The person who told me said the Vets will sort it out. The Hedgehog is so lucky! Yeah, the Hedgehog is very lucky. Hopefuly it will all be sorted out soon. Is there any news on it then? Fingers crossed he/she is doing ok. I'm not looking after it. It would not be fair, as I have GCSE stuff and that, plus other things to sort out. So this woman not far down the road who I know is familiar with Hedgehogs, and has looked after them before- is taking him in. Yes- him. I got to see him, so I'll call him 'Wobbler' - he was very wobbley on that leg. It's good you get to see him, presumably he is doing ok?